May we tell you about some of our favorite resources? The Merck Veterinary Manual provides comprehensive, up-to-date, and accurate animal heath info. Fiber festival in central New York state. 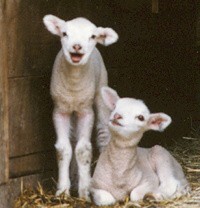 A non-profit, educational organization promoting sheep and wool products in NJ. The largest sheep and wool festival in the US. Fiber mill in NY offering washing, picking and carding of all types of fiber. Excellent service! Full service fiber mill in MI offering washing to spinning - long wools a specialty. Fiber mill in MI offering processing to batting and roving. THE magazine for hand spinners. Whether you use a spindle or spinning wheel, Spin Off is a must read! Step into the world of weaving with Handwoven magazine, the best weaving magazine on the market! Magazine covering a wide variety of topics on interest to shepherds. The nation's largest all-breeds sheep magazine. Results posted of all sheep shows and sales. The NCWGA assists members in the development and promotion of naturally-colored sheep and their wool. Tannery for sheep skins and hides of other species. Professional laboratory for testing of forage, soil and water samples. Providing AI services for sheep from a large catalog of US and foreign registered rams.